Sometimes, there’s nothing better than spending time outdoors. Time in nature can clear the head and soothe the spirit. At home, a dedicated nook outside is priceless. However, spending time under the sun can be uncomfortable during scorching hot days – or even regular afternoons in the Philippines. It’s not just your discomfort at stake, but direct sunlight at certain hours of the day can be risky to the skin. To keep the harmful rays away, sun protection on the terrace is important. Before starting to create your dream patio, inspire yourself with 10 of our favorite ideas for sun protection in your outdoor sanctuary. Enjoy! 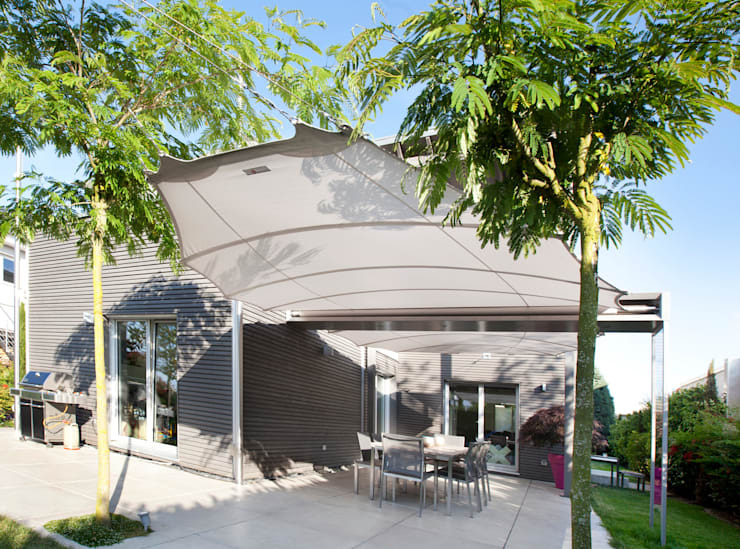 Shade sails are becoming more and more popular due to its resort-style vibe. Here, it completes the picture of relaxation in the garden with the trees framing the sitting area. Plus, this model from C4sun features a particularly innovative technology with the sails neither fluttering nor beating in the wind. The absence of movement and noise creates an even more tranquil nook in the garden. For patios that are bigger than the norm, make it a double. Sun protection is a must in the patio, no matter the size, and there are large-area alternatives out there that can keep the entire garden’s sitting area shaded. In the featured terrace, a portion of the tiled space is left unprotected but the al fresco area is under twin shade sails. Shade sails come in an array of different hues. For neutral-colored residences, one way to add some character to the design is to add brightly-hued accents such as sails that also offer much-needed sun protection to the garden. The color is a stark contrast to the rest of the house, making the outdoor space a standout in any neighborhood. 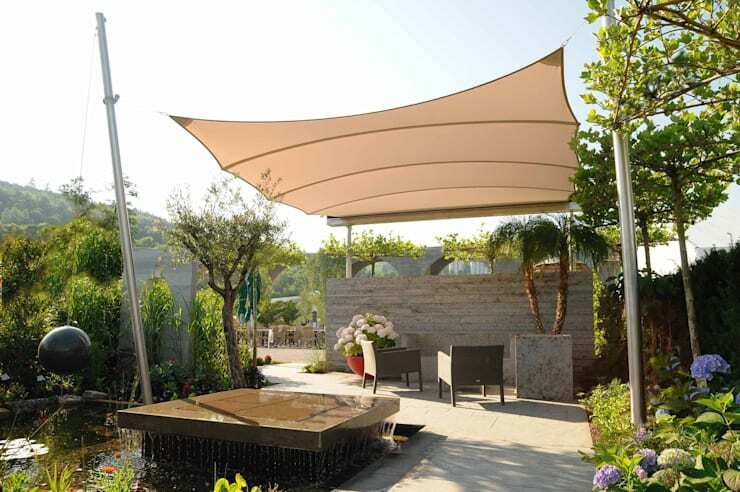 Of course, a shade sail protects from the sun, but water-resistant variants like the one above also safeguards the al fresco area from the wind and rain. 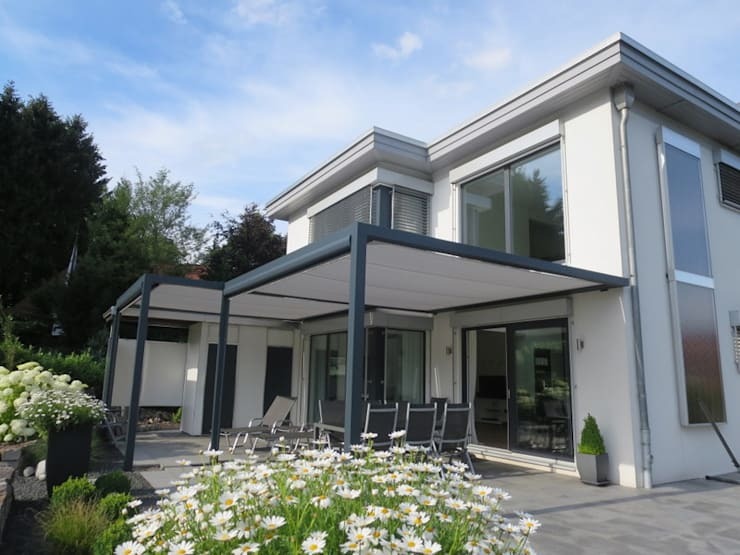 All-weather types of shades are a good investment as they ensures protection of the terrace all-year-round. It’s particularly important for porches and furniture that are sensitive to the elements such as wood and textile. While there are many advantages to shade sails, many types are not so durable, especially in the face of fickle weather. One way to make it last a bit longer is to find roofing that are hardier with sturdy foundation. Here, the combination of polyester cloth and steel posts offer strength as well as sun protection and undeniable style. Sun protection in the veranda doesn’t need to be complicated. 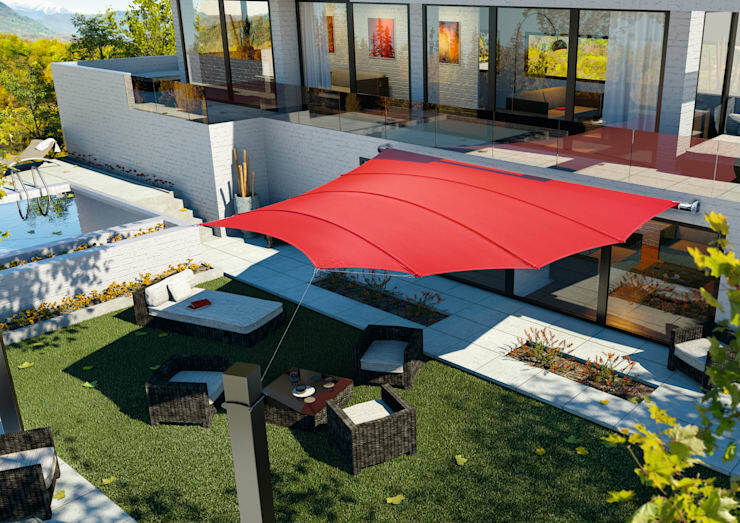 Simply purchasing a patio umbrella can go a long way. 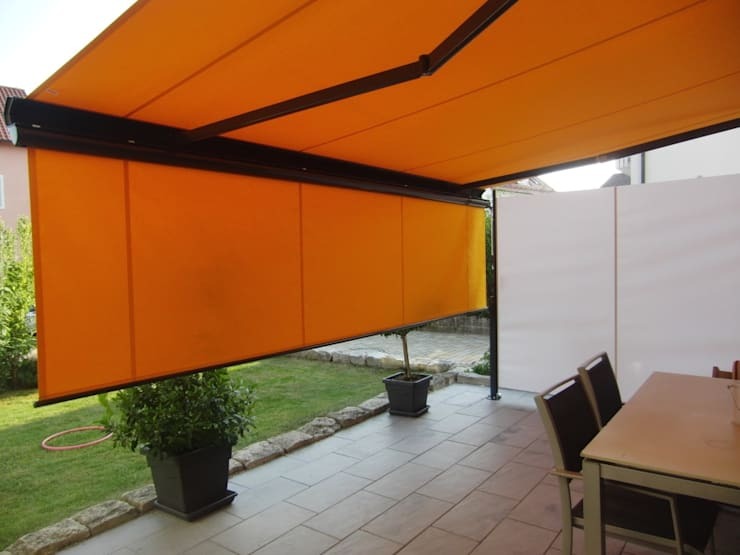 While it can only provide shade to a limited space, it’s certainly enough for a lounge chair or a table and the umbrella is readily available in many hardware stores. Simple, affordable and effective, this is a quick-fix solution that anyone can enjoy. 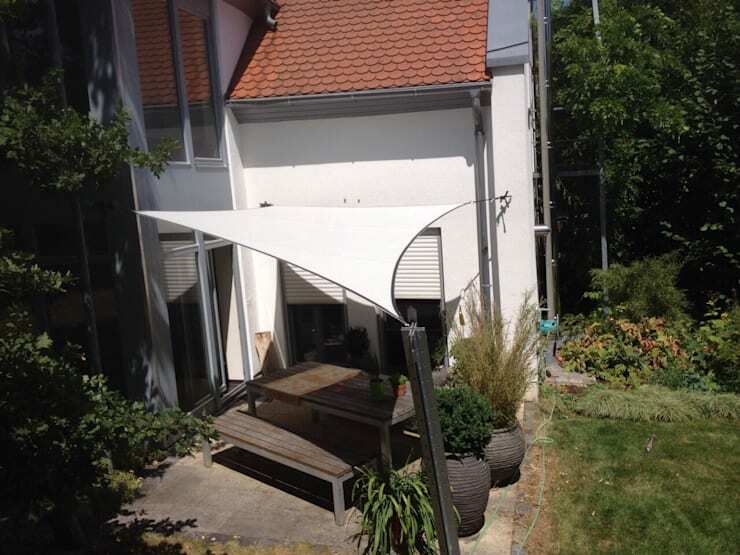 Another traditional way to protect the garden garden from the sun is the awning. The featured patio above reveals a beautiful model in a stunning color. Awnings are quite flexible as well, since it can be easily retracted during nighttime or when the family is in the mood for some sun. 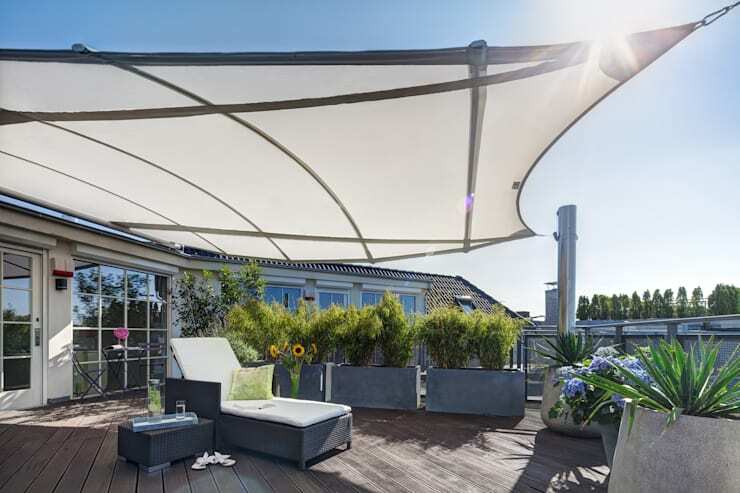 This striking, trapezoidal cloth protects a large terrace from the sun. As it arches lightly and elegantly upwards, it’s able to offer a more extensive sun protection than conventional shade sails. The sail is stretched and tied to beams, so it doesn’t keep the residents from enjoying the beautiful panorama. 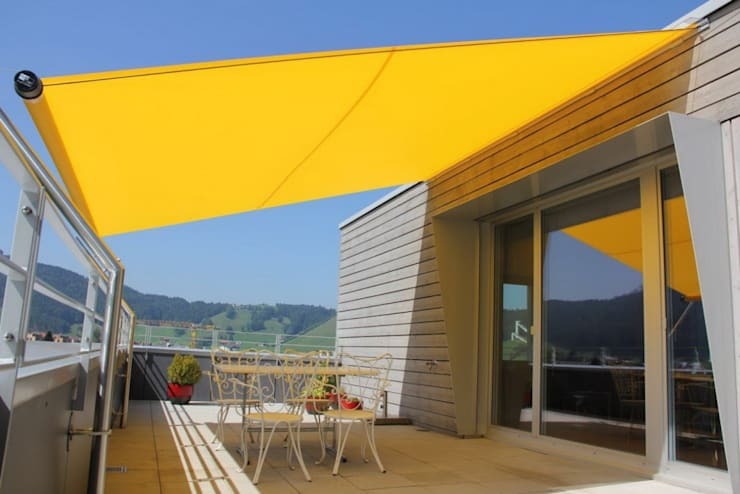 Much like awnings, this merry-yellow shade sail can be rolled up and down as the homeowners prefer. Here’s a high-tech and creative approach to sun protection in the garden: the Cubola®. The pergola-like innovation is a fully-electric, roll-up system that residents can control so they get the sun when and where they want it. It can be mounted freely or attached to the façade. For more roofing ideas for your outdoor space, see these 8 amazing terrace roofing designs you’ll love.